John William Condon was born 13 December 1867 in chicago, Illinois to John Edward Condon and Margaret Cleary Condon. On 30 September 1896 he married Frances Loretta Thurber (born Fanny Catherine Foley) in Our Lady of Sorrows Church in Chicago. Frances was born 4 February 1877 in Hamilton, Ontario, Canada. The first known address for John was 347 S. Jefferson (now 810 S. Jefferson) in 1870. John died 22 January 1919 in Ravenswood Hospital, Chicago. Frances died 7 March 1937 in Evanston, Illinois. They are both buried in Mt. Olivet Cemetery in Chicago. For further details, contact the Chicago Genealogical Society. 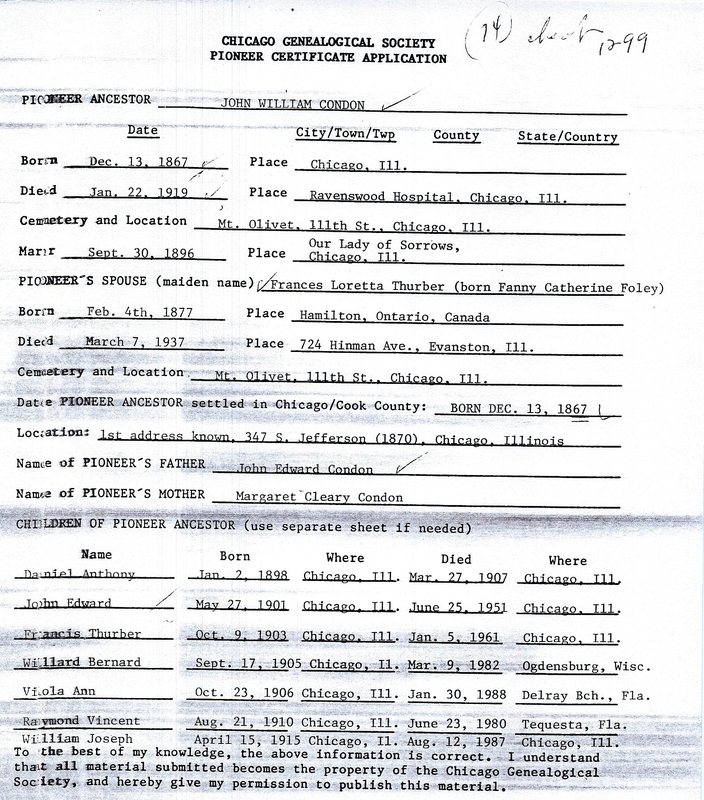 John William Condon is Pioneer Ancestor number 74.